Something special is happening in France. A nationwide campaign will be launched next week by the Colibris movement for the 2012 Presidential Elections – but without a charismatic leader. The campaign, instead, is for everyone to be a candidate – for a new kind of politics. In their language and tone-of-voice Les Colibris are like the Transition Movement, but different. They are like Occupy Wall Street but different, too. This is surely healthy. The movement for a global democracy is an ecology, not a single homogeneous movement. “We know that an election won’t change society” says the Colibris manifesto [colibris is the French for hummingbird]. “For a real transformation, things have to change at the bottom and involve everyone amongst us”. 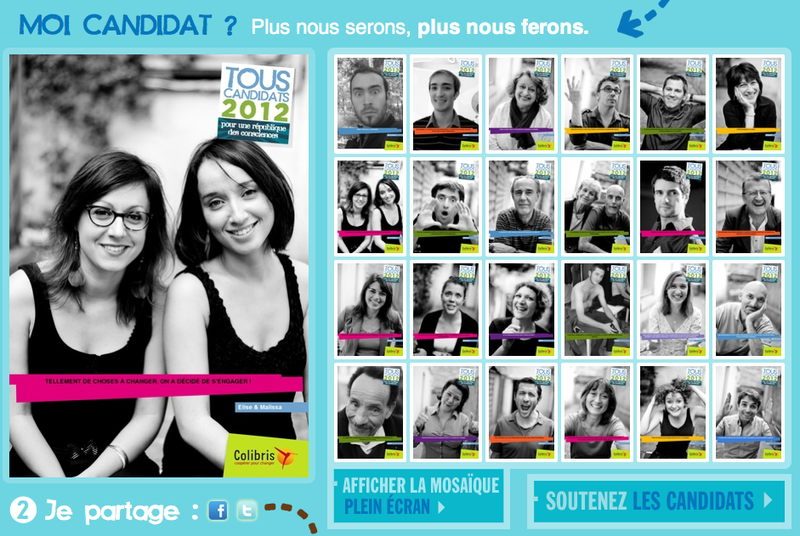 Les Colibris, who call themselves a ‘Movement for the Earth and Humanity’, are not just about grassroots activity. They also highlight global issues that traditional politics is unable to engage with: climate change; the sixth massive extinction of species; the fact that nearly a blllion people on our planet are the victim of famine. The idea is not to vote for a programme, or delegate power to a government, say the Colibris. The aim is to mobilize much wider participation in the radical social experiments that have emerged in recent years: low-impact housing, off-grid energy, seed sharing, community-supported agriculture. Social transformation is already happening, say Les Colibris, but now it is the time to deepen and amplify that change. 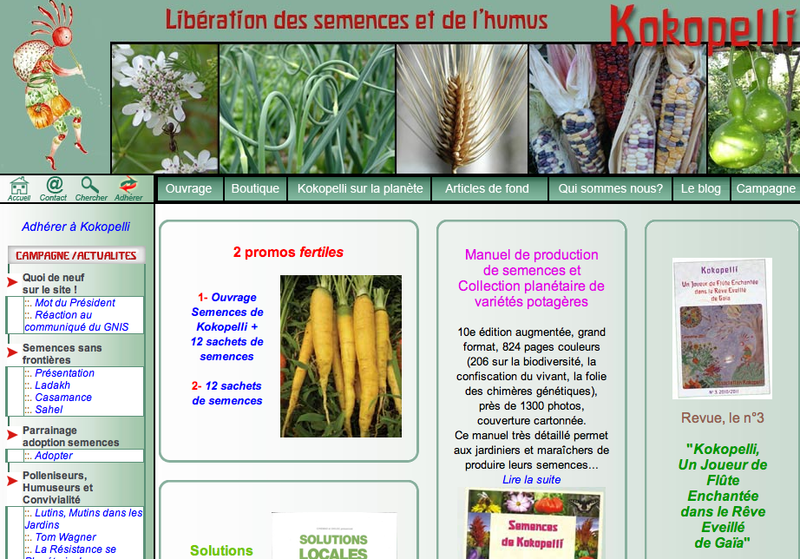 The founder of les Colibris is a 73 year old Algerian-born farmer, philosopher and environmentalist called Pierre Rabhi. Without being a presidential candidate, this remarkable figure is having an extraordinary impact on the culture of this resolutely human-centered, nature-dominating country. Back in January I joined the second of two sell-out crowds in Le Vigan, a small Cevennes town near where I live, to hear Pierre Rabhi speak. He talked about ‘the deep fear that is in us all’ as the impacts of modernity are felt. He went on to describe such concepts as “happy sobriety”, a “de-growth economy”, and “agro-ecology”. Rabhi’s language is alien, to put it mildly, to the normal rhetoric of hustings politics. But this was a culturally-mixed and decidedly unsentimental crowd. They came in large numbers – in le Vigan, as elsewhere in France – because here, for the first time, is a public figure who makes an economy of moderation and balance sound attractive, and do-able. The atmosphere when Rabhi speaks is the opposite of sanctimonious. On the contrary: he is is catalysing a social movement that, while serious and determined, is also light. Rabhi even made a joke about cutting own oak trees. Asked, towards the end of his Le Vigan meeting, whether he believed in life after death, the non-candidate for President of France replied that ‘I’m more preoccupied with life before death… but in the long run, I am compost’. 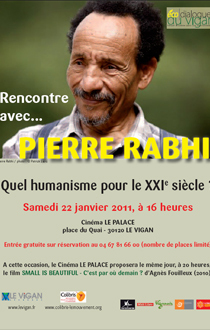 Pierre_Rabhi [I’m quoting Wikipedia here] was born into a Muslim family an an oasis in southern Algeria, in 1938. His mother died when he was four years old. His father, a blacksmith, musician and poet, was forced by economic circumstances to close his workshop and work in the mines. The father persuaded a French couple to raise Pierre; his childhood thereafter was shared between France and Algeria, and the Catholic and Muslim worlds, until he was 14. He chose to convert to Christianity when he was sixteen, and completed two years of secondary education, but had to leave college because his family were unable to cover the costs. When the Algerian War broke out in 1954, Rabhi was rejected by his father for having converted to Christianity, and by his adoptive father following a dispute. He decided to settle in Paris. In France, Rabhi, with no knowledge of agriculture, moved with his new family to the country; this was well before the French ‘neo-rural’ movement of the late 1960s. 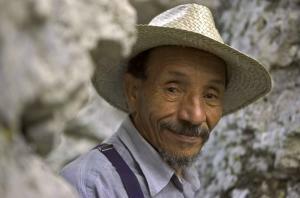 In 1963, after three years working as an agricultural worker, he became a goat farmer. Appalled by the impacts of industrialised agriculture on ecosystems he had witnessed in the Sahara, and around him in France, he developed the practice of ecological agriculture. Rabhi wondered whether his experiment was transmissible. In 1985, he set up an agro-ecology training centre; and in 1988 he also founded an International forum for the sharing of knowledge about applied agricultural practices, CIEPAD. “I realized that the South had been trapped by modernity, that it was connected through chemical fertilizers and pesticides” he explained; ‘the South is especially affected by ecological disasters, by the disappearance of animal and vegetal biodiversity, by desertification’. He has since launched oversees development programmes in Morocco, Palestine, Algeria, Tunisiea, Senegal, Togo, Benin, Mauritaniea, Poland and the Ukraine. Rabhi’s work had a big influence on the emerging anti-globaization movement. 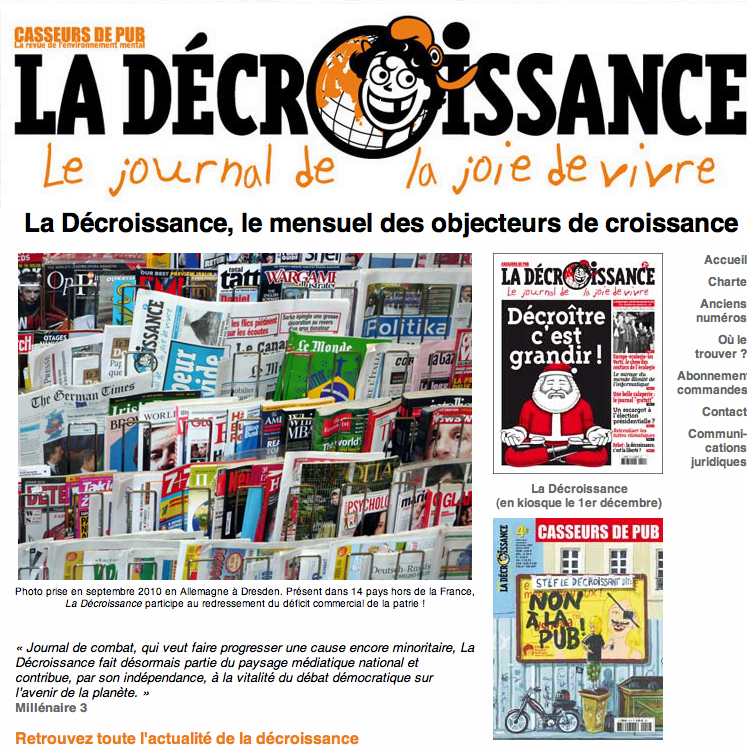 He is a member of the board of editors of the French monthly La Décroissance– ‘De-Growth’. He is also vice president of the Kokopelli Foundation. Kokopelli works to protect biodiversity in the production and distribution of organically and biodynamically grown seeds, and for the regeneration of the fertility of cultivated soils. In 2009, Rabhi founded Terre et Humanisme [Colibris], an ‘international movement for earth and humanism’. Since then, more than two million people have been involved in Colibris’ place-based projects and encounters, and more than 100 groups have been launched. These aim in different ways to create ecological and socially ways to organize daily life. A plethora of initiatives includes AMAPs [community supported agriculture schemes]; apiaries; ecological building workshops; shared gardens; and other educational activities. 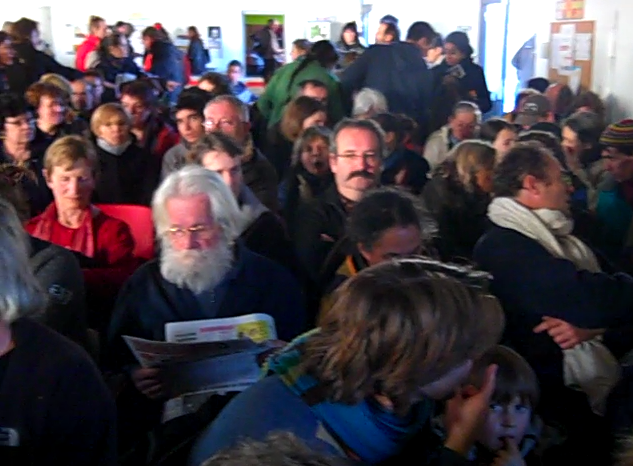 [This film, as an example, is about citizens of Rennes developing their own climate plan. It’s not dissimilar to the Energy Decent Action Plans being pioneered by the Transition Towns movement]. The idea of the ‘campaign without a candidate’ is to demonstrate to French citizens that an alternative to politics-as-usual is possible. Describing the campaign as an “insurrection of the conscience”, Rabhi explains that the campaign is not about reforming present society with its ‘banal consumption’ and ‘pervasive fear’. Rather, it is about accelerating the emergence of its replacement. The Colibris campaign is based on a Charter for the Earth and Humanity’. The Charter first outlines five existential challenges: ‘The Disaster of Chemical Agriculture’; ‘Humanity has Failed Humanism’; ‘Disconnection between Humans and Nature’; ‘The Myth of Unlimited Growth’; ‘The Powerless at the Mercy of Money’. It then proposes six responses to these challenges: ‘Embody Utopia’; ‘Happy Sobriety’; ‘Femininity at the Heart of Change’; ‘Agroecology as Indispenable Alternative’; ‘Earth and Humanism are One’; ‘Re-localization of the Economy’; ‘Another Education’. This entry was posted in development & design, social innovation & design. Bookmark the permalink. Post a comment or leave a trackback: Trackback URL.